Alex Beecroft – Author of Gay Romance » Blog Archive » Grab your free Asexual detective novel now. Grab your free Asexual detective novel now. Still, I can call myself an Amazon bestseller, which is always nice, and what’s nicer is that people seem to be reading it and then coming back to buy Murder of a Straw Man, the first in the series. This is the one with the asexual sleuth and the gay sleuth who are housemates. So far the cozy mystery audience seem to be much more open to reading books with LGBT characters than the SF/F audience.The “OMG, why is everyone gay?” comments on the mysteries are much less vitriolic than the ones I’ve been getting on Cygnus Five. Anyway – enough waffling. 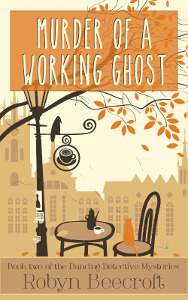 If you are interested in getting Murder of a Working Ghost for free, grab it now, as the promotion only lasts until the 9th.